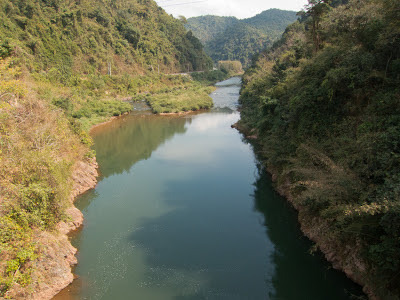 Muang La, Oudomxai: After 3 days of travel – bus to Chiang Khong, boat to Pak Beng, bus to Oudomxai – we knew we needed at least 2 nights in Oudomxai (also spelled Oudomxay, Udomxai, Udomxay, Muang Xay, Xay Town). However, we're having such a good time in the heart of Northern Laos, that we've already extended our stay here to 4 days. On Day 2, we rented a Chinese motorbike (a Zongshen Cub, 100 cc semi-automatic 4-speed) and traveled up to Muang La, said to be one the fave places of Joe Cummings (of Lonely Planet fame). It was great riding through an undulating, narrow river valley with lots of agricultural diversity and as many ethnic groups. We didn't find the recommended Buddha footprint en route but we did find a local handicraft shop specializing in Khmu bark weaving. 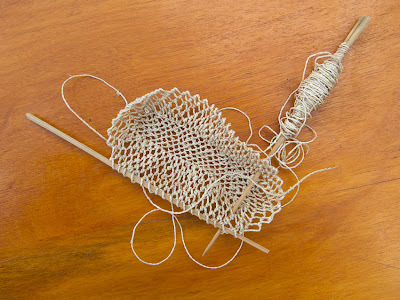 We've been wondering for years where a particular type of net bag comes from. Now we know! “Bark” is a bit of a misnomer. There were actually products made from 2 types of wildcrafted fibres that involve lots of processing and we bought some of both, of course. Anyway, the Khmu people in Laos have long made fibre by processing the inner bark found between the outer bark and the woody core (technically, the nutrient-rich phloem from the dead epidermis and inner xylem) of their chosen tree – a labour-intensive process involving a really sharp knife and much patience. 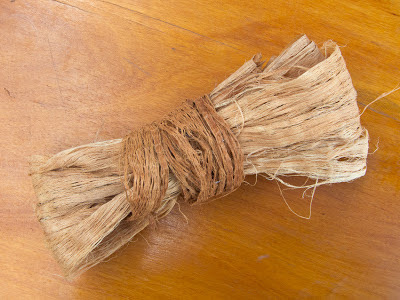 This must be dried, pounded, split into very thin strips and then twisted by hand, usually by rubbing it along a Khmu woman’s leg and then twisted again to join it into a continuous “yarn.” This can then be woven into narrow bolts of fabric, generally about 5 metres (or 6 yards) long. Depending on the season and the tree (remember that gender thing?) the colour will vary from off-white to deep brown. So, we bought 2 rolls of this fiber, about 32 cm wide and 6 metres long, to make…something unique. We also found those net bags we’d seen in markets and souvenir shops (without provenance so we've never bought them before). This time we know where they came from, right down to the village, and how they were made. They’re made from kudzu vine, which the Khmu call kheuapiad. Rather than the invasive species we consider it in the West, this jungle vine has long been used by Khmu people to make fishing nets and netted bags. Unlike in Japan, where only the root is used for fibre, the upland people in Laos use the inner fiber. Like kudzu, it’s a time-consuming process to strip, dry, split and twist this into a workable fibre. 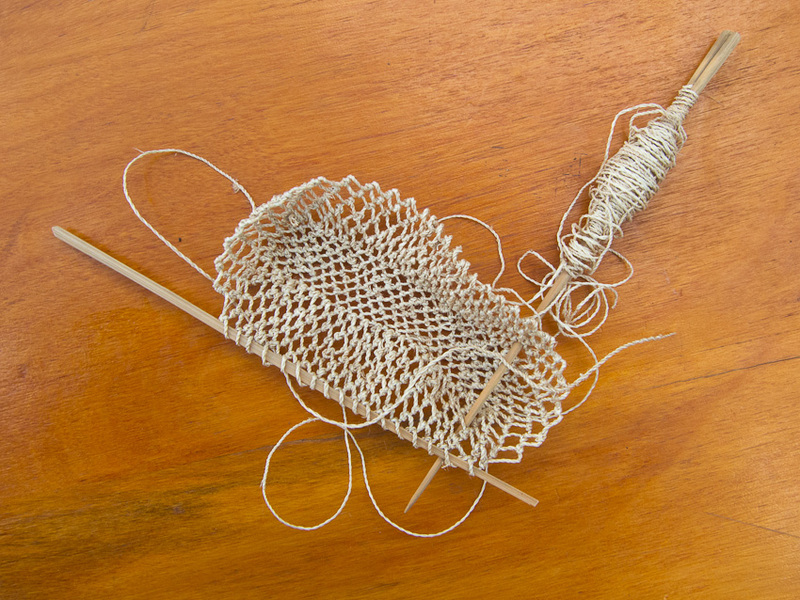 Traditionally, the resulting fine twine is netted with a piece of bamboo fashioned into something resembling a crochet hook. Like yaboi, it can be woven on a backstrap loom into narrow fabric. It can also be dyed as yarn before the final product is made. No surprise that when we headed back to Oudomxai town, the bike was more loaded than when we set off. Before going back, though, we had Lao PDR (please, don’t rush) lunch at a local café that allowed us to sample some the many vegetables we’d seen growing along the route. We also took time to stick our fingers in the local hot spring and, last but not least, stop at the Buddhist temple across the river that locals regard as THE destination for supplicants. On our way out, Ellen noticed some young women and men dressed in ethnic dress too perfectly matching to be anything but staged. 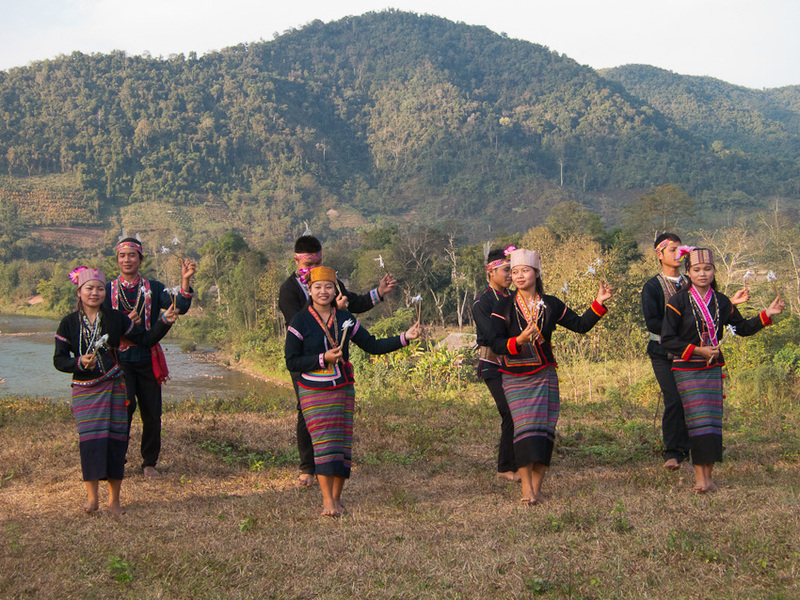 We followed them to the edge of a grassy area overlooking the river below and, sure enough, they were performing traditional Khmu songs and dances being recorded by a professional cameraman...and Ellen, of course. We have greatly enjoyed our time here in Oudomxai, the heart of Northern Laos, especially our discovery of new, interesting, wildcrafted fibres.